This lesson explores many of the things in which people base their identity and sense of self-worth, e.g., wealth, power, fame, etc. It encourages participants to consider the danger of living life in this way and the value of basing our identities solely in Christ. Write out the following words or phrases, each on an individual note card. Depending on your group size, you may want to use fewer cards or make up more of your own. Shuffle the notecards, and keep them in a stack for passing out, or place them facedown on a table. Write the Scriptures you want to use on slips of paper (one set of verses per slip). Pass out the slips of paper to different participants before you begin, and ask them to be ready to read them out loud. 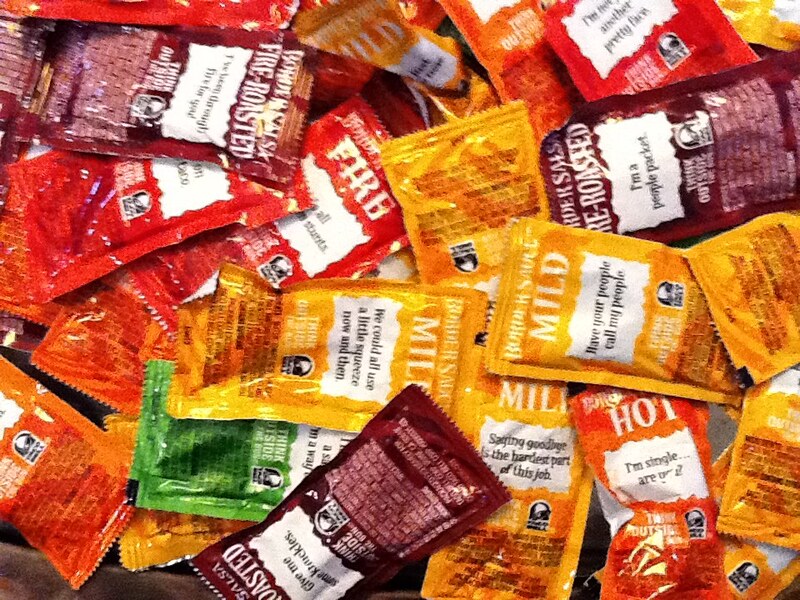 · Get the taco sauce packets or print the file, and cut out the different packets so that each one is on a separate slip of paper. · Put the packets or the slips of paper into bowls (one per group). How did you feel whenever you were given one of the pickup lines? …whenever you were the ones delivering them? Why don’t you think pickup lines usually work? What do you think is a better way to get to know someone new? This icebreaker takes longer than most to facilitate, but it can be a fun way to start an event where it is important for the group to think creatively. Participants will work together in teams to create puzzles from their own illustration of different types of animals. Another team will solve the puzzle. Each person on your team must draw on at least four cards. What was challenging about that activity? What would have made it easier? How is this like the work and challenges you experience in your teams? This fun icebreaker energizes and adds some silliness to a workshop. It requires focus and concentration. Someone gets confused and says the wrong word (or a correct word in the wrong order). This energizer is fast, easy and takes little preparation, and it’s ideal for right after lunch or when you can sense the energy is draining out of the room. This fun icebreaker can be an energizing way to get participants going, or you can use it to select people for certain activities. It’s the familiar game of Rock, Paper, Scissors with a few twists. This game is not played with just the hands – it’s a full-body activity. And instead of using Rock, Paper and Scissors, participants act out Samson, Delilah and the Lion. This fun icebreaker can be an energizing way to engage participants. It’s a “personality assessment,” but it’s just for fun; there is no scientific value to the results. Toward the top of the paper – You have a tendancy to be positive and optimistic. Toward the middle – You have a tendency to be a realist. Facing left – You have a tendency to believe in tradition and be friendly; you may also be prone to remembering dates well. Facing Right – You have a tendency to be innovative and active, but may be prone to forgetting dates easily and may not have a strong sense of family. Facing front – You have a tendency to be direct, and may enjoy playing the role of devil’s advocate; you also are prone to neither fearing nor avoiding confrontational discussions. With many details – You have a tendency to be analytical, but may also be prone to being cautious to the point that you struggle with trust. a great risk taker and may sometimes be prone to reckless and impulsive decisions. With less than 4 legs showing – May indicate that you are living through a major period of change and as a result you may be prone to struggling with insecurities. With 4 legs showing – You have a tendency to be secure and to stick to your ideals; however, others may describe you as stubborn. With large ears – Indicates how good of a listener you are (the bigger, the better).